During the last two decades, a combination of poor management practices and intensive culturing of penaeid shrimp has led to the outbreak of several viral diseases. White spot disease (WSD) is one of the most devastating and it can cause massive death in cultured shrimp. Following its first appearance in 1992–1993 in Asia, this disease spread globally and caused serious economic losses. The causative agent of WSD is white spot syndrome virus (WSSV), which is a large, nonoccluded, enveloped, rod- or elliptical-shaped, dsDNA virus of approximately 300 kbp. WSSV has a very broad host range among crustaceans. It infects many tissues and multiplies in the nucleus of the target cell. WSSV is a lytic virus, and in the late stage of infection, the infected cells disintegrate, causing the destruction of affected tissues. The WSSV genome contains at least 181 ORFs. Most of these encode proteins that show no homology to known proteins, although a few ORFs encode proteins with identifiable features, and these are mainly involved in nucleotide metabolism and DNA replication. Nine homologous regions with highly repetitive sequences occur in the genome. More than 40 structural protein genes have been identified, and other WSSV genes with known functions include immediate early genes, latency-related genes, ubiquitination-related genes, and anti-apoptosis genes. Based on temporal expression profiles, WSSV genes can be classified as early or late genes, and they are regulated as coordinated cascades under the control of different promoters. 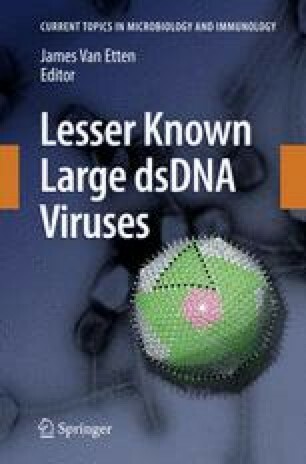 Both genetic analyses and morphological features reveal the uniqueness of WSSV, and therefore it was recently classified as the sole species of a new monotypic family called Nimaviridae (genus Whispovirus).